Irish media can welcome a boost in investigative journalism with the launch of Journal Media’s new initiative, Noteworthy. The project launched last week and is a platform to crowd-source funds for investigations. The initiative was developed by Adrian Acosta, Chief Executive of Journal Media, and the editorial team behind TheJournal.ie who successfully applied to Google’s Digital News Innovation Fund to support the project. The concept is relatively simple. The public can submit ideas for stories they want to see investigated. The journalists then develop more formal proposals and then put them to the public who can fund the investigations they want to read about. Noteworthy also facilitates a wide range of ways to produce investigative journalism, such as supporting video, and data journalism projects. Media markets in the USA and UK have experimented with crowdfunded investigative journalism such as Civil and Beacon. 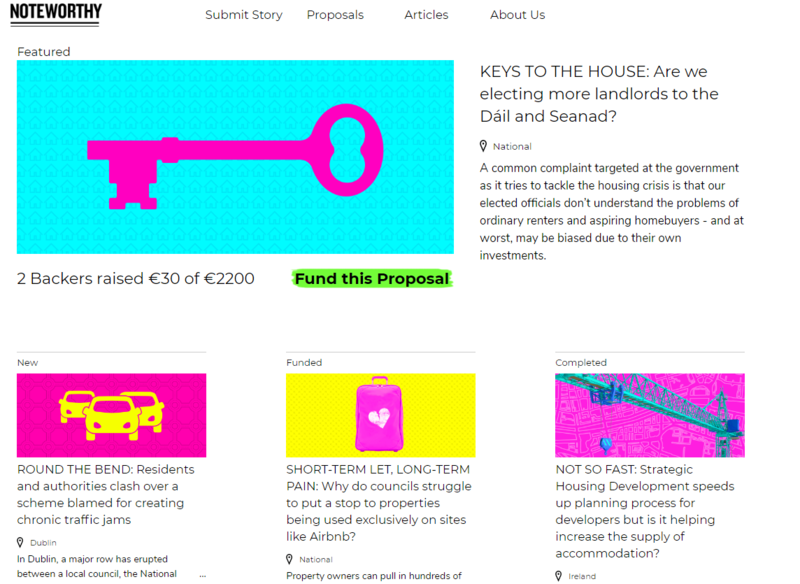 While titles such as the Dublin Inquirer have crowdfunded specific stories and freedom of information initiatives such as Right to Know use crowdsourcing to support their work, Noteworthy is the first ongoing journalism funding portal for Ireland. Although the project has not been running for long, four of the first ten proposals are already fully funded, and others have received some support. “We have been very surprised so far,” said Ken Foxe, Editor of Noteworthy. “It has exceeded expectations already. It is a challenging thing to try and develop, but we have been pleasantly surprised so far,” he said. To begin, Noteworthy will focus on small and medium-sized investigations but later hope to engage in much larger and more in-depth stories. The website also has a general fund to help support investigations that can not yet be made public. Mr Foxe explained, “For a variety of reasons not all stories can be made public as a proposal. There are issues around Defamation, and also there are stories that could not progress if they were made public too soon.” In such cases, the general fund can help support the investigations that need to be confidential until complete. Stories that are currently getting backing address issues around housing, transparency in local councils, political pensions and compensation culture. Mr Foxe explained that not all ideas can be developed into proposals and that the team only take on stories they are confident they can deliver. The first round of proposals along with the “the journalism that comes from them” will be published and the website will be officially launching in autumn. “We would like to partner with local media. If a local title had a big story that was on the back burner and the day to day issues end up taking priority, or if there was something too big to resource at a local level, we would love to partner on projects like that,” he said. Journal Media notes that the business models that have developed in digital journalism are not conducive to supporting investigations. Noteworthy offers an antidote to the decline in investigative journalism and the resources available to engage in original stories. Often big stories of the day are initiated by politicians or business highlighting problems they face. This provides the public with the opportunity to direct Irish journalism to address the issues that are faced by communities and unearth practices that authorities would rather remain hidden. “The commercial reality of journalism in the modern day is that it is not always feasible to dedicate resources to long investigations. But newsrooms want to engage in this, so it about formulating a new way of doing its” said Mr Foxe. With significant cuts in some of the seemingly more successful digital newsrooms such as Buzzfeed and Vice, the need for a sustainable funding model for digital journalism is pressing. And Ireland is a smaller media market, needs to innovate to ensure that it keeps pace with the international markets. “We need new ways of doing things, said Mr Foxe. Noteworthy is in beta format for now, and the official launch is expected to take place this Autumn. PreviousWhat’s shaping the mainstream news agenda?